ALEXANDRE LACAZETTE HAS travelled to London to finalise a club record move to Arsenal for an initial fee approaching £46 million (€52m), according to British media reports. The Lyon striker is expected to sign a five-year contract at the Emirates Stadium after the Gunners increased their opening bid. 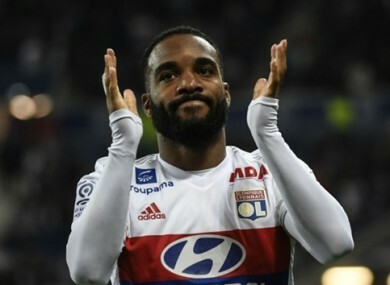 Lacazette, 26, has scored over 20 Ligue 1 goals in each of his three seasons for Lyon and will join Arsenal for a club record fee, eclipsing their previous record transfer of £42.5m for Mesut Ozil that was made in 2013. With hopes of signing Monaco’s Kylian Mbappe — a Real Madrid and Paris Saint-Germain target — fading, Arsenal manager Arsene Wenger managed to convince another of Ligue 1′s star forwards to play at the Emirates Stadium. Lyon club president Jean Michel-Aulas, who sanctioned the transfer on Sunday, has previously said the Premier League side must part with €65million to prise Lacazette away from Parc Olympique Lyonnais and the newly agreed deal includes bonuses worth £6m. France international Lacazette was close to joining Atletico Madrid before the Spanish club’s transfer ban was upheld and Aulas confirmed via French news outlet Le Progres that Wenger’s side did not want to pay over the odds for the forward. The Gunners still hope to keep Olivier Giroud, although they are prepared to let Lucas Perez — who joined last August but scored only once in 11 Premier League matches — leave the north London club this summer. Arsenal also remain hopeful of a deal for Thomas Lemar as well, but the youngster does not appear ready to force a deal to the Gunners, while Riyad Mahrez also remains a target of Wenger’s after personally speaking to the 26-year-old over a fortnight ago. Email “Lyon star travels to London to complete club record €52 million Arsenal move”. Feedback on “Lyon star travels to London to complete club record €52 million Arsenal move”.